Today, with the elections over, we were cataloging the various manifestos, party and personal, that we received. In one of the acid free boxes in which we keep them safe, we came across a one sheet item. It was the manifesto of the Democratic Party. Like so many publications that surface in St. Kitts, it was undated and did not name a publisher or a place of publication. 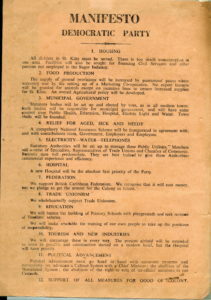 A look through the election results of the 20th century revealed that the only time that a party fielded candidates under that name was in 1957, making this the oldest manifesto in our collection. We do not know if any earlier ones were ever printed as a separate election publication but we have come across detailed reports of what the candidates had to offer in newspapers. In 1957 there were 5 electoral districts in St. Kitts, 2 in Nevis and 1 in Anguilla. The candidates for the Democratic Party were Basil Samuel for Basseterre East, Col. J Wigley for Basseterre West, and C Browne for Sandy Point. The Party did not present any candidates in Dieppe Bay and Cayon.